I bought my first digital SLR camera just over three years ago. My trusty Canon EOS Rebel T3 and I starting learning everything there was to know about digital photography. Each time, a new method, technique, or on special occasions, getting new gear, to keep my fascination thriving with photography. During this time of early development, I often considered what it may be like to experiment with film photography but couldn't quite come to pay the mind. It wasn’t until August of 2015 when I loaded my first roll and start the encroachment into foreign territory. What could have ended there, didn’t. Due to happenstance, or maybe even destiny, a string of impacting events seem to play the catalyst in what is now a strong attraction to the analog practices of yesteryear. The adventure begins with the purchase of my first 35mm film camera of the year, the adorable Canon Canonet 28. I read an article highlighting some of the notable film camera systems from over the years and I recalled seeing the Canonet on the list, however, just a different model. I bought the thing anyway; it was a steal at $25, with no shipping on a local sale. As luck would have it, the battery was stored safely with a plastic seal and once removed, still functioned perfectly. The first roll of film I tried to load failed, it was not even close. One roll out of the 4-pack, already gone. I quickly learned from my mistakes and successfully loaded the 36 soon-to-be-shot exposures, and I was off to capture the world. What is interesting about the learning process of analog photography is just how different, yet similar, the process is to digital. With film, of course, you will want to shoot sparingly since there is only a finite number of snaps you have before you need to change rolls, or worse, have to go out and buy more film. On the other hand, it is addictive! There is something about gazing down the sight of a rangefinder camera, manually focusing, all while trying to work within the constraints of the hardware’s strange quirks that strangely keeps me wanting more. It gives me the familiar feeling of trying something completely new and making a complete mess of it, like trying to make homemade waffles. While the end product may leave something to the imagination, the learning process can be just as rewarding as shooting a few keepers. Bag, 2 dial-thingies, 2 lenses, camera, filters, flash and film. $20 gold mine. In photography, the learning process doesn’t ever actually end. There is always something new to discover, a new technique to try, or maybe a different way at looking at things. I am always trying to find the next thing to keep my fire going. Since adopting film into my regular shooting regimen, I find that there is much more curiosity going on in my thoughts and that there is so much more to learn. Whether it is learning new terms, like reciprocity failure, or Velvia; or learning why the Canonet 28 has a fixed shutter speed of 1/60 when in Av-mode; film photography has many strange little facts that can and will help you be a better photographer in the end. Much like digital photography, there are many hiccups that may arise. And trust me, they will. These learning opportunities arise, but they are often cut from a different cloth. Due to the nature of digital photography and its instant-feedback, many of the things that come up are easily corrected by recomposing, or maybe Photoshop. With film photography, most of the time you won’t know until you get your film back from the lab. For me, this is when I started to celebrate my failures. For years, I was always looking for perfection in my images. I thought, “Things could always be just that much sharper, colors could be just that much more punchy”, and much of the like. It’s very easy to get caught up in that world and focus on what images need instead of what they are. Shooting with film has helped me realize the beauty in simplicity and to hone my skills as a photographer. I have started to celebrate the imperfections in my work, and as a result, I am much more satisfied with the images I am creating. 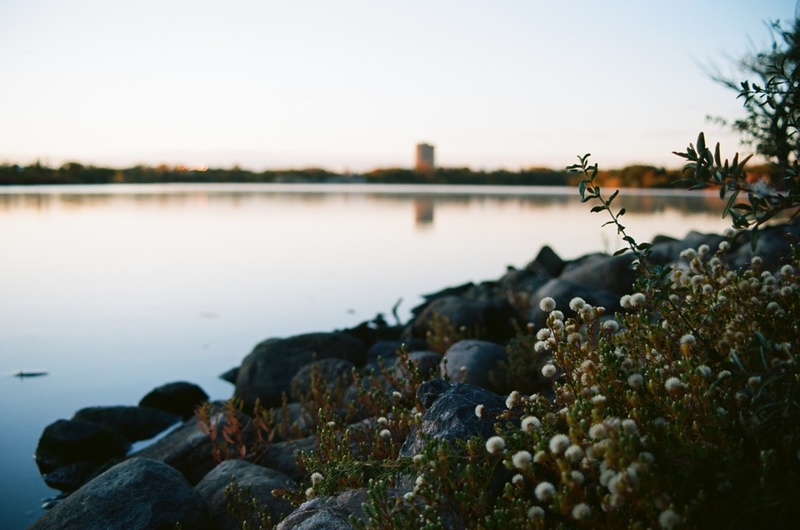 Take, for instance, a shot I took during late September at Wascana Lake in Regina, Saskatchewan. I knew I was going for a double exposure, so I took the first shot of some wonderful rocks nestled cozily along the shore of the lake. Because my Pentax K1000 doesn’t have a dedicated multiple-exposure function, I pulled up the film rewind column and hit the rewind button while pulling film advance crank to reset the shutter, without advancing the film to the next frame. At least that was the plan. You know when you move something mechanical in-nature, and it actuates smoothly through the cycle, and it feels right? That didn’t happen here. It felt smooth as silk for the first half and smooth as a crumpled cardboard box for the last half. It wasn’t until I received the photos back from the lab that it only loaded half of the frame, creating a 1.5x exposure, coincidentally cutting the frame (and subject) in half, resulting in a very interesting photograph. The point of it all is being able to slow down and focus on the things that really matter, resulting in stronger images. I recently took some creative advice to try my best to simplify my photography. While great advice for photography, it also makes great advice for life, too. By constantly simplifying, you can really focus on what makes the photography special. Since I have started shooting with film, I have taken a simpler approach to my imagery. I find that I no longer require post-production. By loosening my grip on the will to attain perfection, I have started to find other ways that I can achieve the same level of satisfaction, without all of the anxiety. To take it to another level, I made a strong connection with color transparency film, or slide film, for similar reasons. With negative film, there is more flexibility in the developing stage to allow for shifts in exposure either up or down (push/pull), giving more control to the lab technician who is lucky enough to develop your photos. If they are under or over-exposed, it is easily corrected and often goes un-noticed in the absence of EXIF data. With slide film, it isn’t as flexible; the roll is simply developed without being able to fine-tune the exposure. This means that what you see is exactly what the camera captured, with no further influence. To add to the allure and mystique of color-reversal film, the best part is that you can view the photos directly from the developed film itself. They are developed as a positive image and will always be able to be viewed as long as you have eyes. Unlike negatives, or digital images, slide film requires nothing more than your eyes to view. There is no need to convert negative film or read data from obsolete media; it’s already there, right in front of you. When viewed on a light table, you are seeing the actual color and tone from the film and not a digital rendering, which can be constrained by technological or economical limits and produces an inferior result (at this time). Shoot a roll of slide film, such as Provia100F, or perhaps Velvia 50, then marvel at the crispness, vibrancy, and ethereal piece of art illuminated before you. The revelation of my first roll of Provia was such an incredible feeling for me. I was incredibly anxious after sending my film in to the lab. I started hypothesizing about the likelihood of my photos being unrecognizably exposed and to make it worse, waiting 10 days for the film to come back doesn’t help. I happened to finish off two other rolls, one Provia100F and another Kodak Ektar 100 and I took them in to the lab. I was happy to find that my first roll of Provia was ready for pick-up. When I got back to work, I sat at my desk and opened the small box of slide film. I held it up to the open window to see just how badly everything turned out. As I unwound the small roll of film, I could see the rich color and crisp details; Each frame displayed characteristics of generally well-exposed images. Relief washed over me and seemed to take all my anxieties along with it. It felt like I took a chance and everything seemed to work out perfectly, so I took a closer look. There is something about the product of medium-format photography that creates a strange sense of dimension. When viewing the slides on the light table, it feels like you are almost in the scene and allows you to connect with the image on a completely different level. It gives me an experience that can’t be reproduced any other way, and one I never thought I would have in my days as a photographer, or otherwise. I have looked at my own photographs before, both digital and in-print but I have never felt the way I did looking at my developed slides for the first time. It has only been a short duration since the beginning of my exploration into analog photography and it feels like I have already learned a wealth of knowledge. There are things about film photography that make learning very easy, like being able to go to any city or town and find a wide array of vintage photography equipment, almost anywhere. Professional-grade bodies, lenses, accessories are usually tracked down quite easily and are almost-always found at dirt-cheap prices. It’s not always yard sales and happy endings, though; Vintage equipment can break down, lose irreplaceable parts, or sometimes you just can’t quite figure out how to use the damn things. Bronica ETRSi + 50mm f/2.8 underneath Albert Memorial Bridge in Regina, Saskatchewan. That being said, there is lots of obscure hardware out there with many strange quirks that definitely impact the way you take your photographs. They are incredible learning tools that can be great to experiment with if you have the time and patience. The more you experiment, the more you learn and take away from it, not to mention the photographs, themselves. I found that after experimenting with a few different combinations of lenses, cameras, and films, I really started being much more observant of my shutter speed and measurement of the available light. 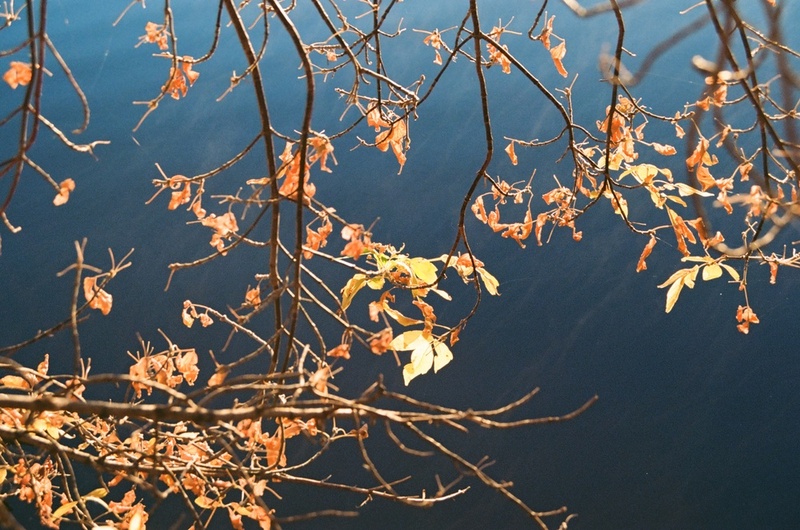 By now, I started shooting primarily film and toting my digital along as an afterthought. When shooting film, you can't just change the ISO-setting. It is what it is when you load the roll. Working within the confines of ISO100, as with Ektar, one of my current favorites, it can be tricky keeping the camera steady at slower shutter speeds. When shooting digitally, it's very easy to bump the ISO a few stops to get the right exposure. If you're shooting wide-open the only option is to lengthen the exposure. So, when I would shoot with my Canon 70D, I still kept her at ISO100 in hopes of working up to a steadier hand while utilizing slower shutter speeds. What better time to ignite a burning passion for light and color than at the height of autumn and its elaborate cacophony of color and descent. But that is just it! My approach and practice of photography is finding something that ignites that creative spark, and exploiting it until you are blue in the face. Whether that be the rich, fine-grain tones of Kodak Ektar 100, or maybe it is finally figuring out exactly how to operate a vintage Bronica ETRSi, medium-format camera; there is always a new lens, film emulsion, technique, method, or subject. The best part is, it and will never, ever, get old. Do you have something that keeps your creative spark going, or perhaps some favorite films that you keep stashed away? Let me know in the comments.